The date: February 23. The place: San Francisco. Event: the Launch Conference, a prestigious event that offered start-up companies an opportunity to seek out fame and fortune. At the event, more than 100 tech start-ups and entrepreneurs were judged by a jury of investors, analysts and industry leaders. The winner got professional help and funds to take their company to the next level. Jorn Lyseggen was happy. "We had members from three companies (Nandimobile, Streemio and RetailTower) from Ghana there," says Lyseggen, CEO, the Meltwater Group, a major SaaS (Software as a Service) company based in Norway. I am meeting Lyseggen in the Meltwater offices in Dubai Media City. This is his first visit to Dubai, to oversee the company's operations in the UAE. The three firms Lyseggen was referring to were the start-ups backed by the Meltwater Foundation that funds the Meltwater Entrepreneurial School of Technology (Mest), a non-profit training and mentoring plan that allows young Africans to become software entrepreneurs. Presentation over, the teams were waiting for the announcement and Mest was in for a pleasant surprise. "Anne Amuzu had won the prize! Imagine, Nandimobile, a company based in Ghana, started by people who didn't even know programming before they came on the Mest programme, and they actually measure up against Silicon Valley start-ups!" To many in the industry, Africa isn't well known as a place to shop for software solutions. But Mest seems to have made a difference there. In the three years since it has become operational, one batch of students has graduated with seven start-ups that are up and running. Mest was an idea that happened far ahead of its time. Says Lyseggen: "My idea was that one day when I was tired [of running Meltwater], I would love to do something different - contribute to the world in a slightly different way. Of course, you contribute a lot in a business context too. But I wanted to contribute in an even more direct way. "When you are young you believe nothing can hurt, that you are invincible. But in time you realise that you are vulnerable too. [You could lose] everything, from friends to family. When a few such incidents happened in my life, my perspective about myself started to change. I realised that you cannot take anything for granted. That really scared me, for I felt it was too important an idea to leave lying around without being acted upon." Lyseggen decided to announce his plan right away. "So in January 2007 I announced it to the company that in a year's time a school for grooming entrepreneurs would come up in Africa." Why Africa? "It's because I believed that the continent would benefit the most from our effort," explains Lyseggen. "I am of Korean origin, and could have chosen Korea. But Korea's fine, it doesn't really need something like this." Lyseggen decided to do his homework well before moving forward and since he didn't know much about the continent he, along with three people from Meltwater, travelled around Africa on a fact-finding mission. "Based on this information we chose Accra, the capital of Ghana, as the base for our school." Why Ghana? "Because it has a number of positive attributes - it is one of the most politically stable countries in Africa, has a strong tradition of education (most African leaders are educated in Ghana), English is widely used as a language for communication, which was important for us because our perspective was international business. Another thing that I felt was important, and also practical is that there are direct flights to New York, London, Amsterdam and Frankfurt. This was absolutely vital for us as we fly in successful entrepreneurs and executives to give guest lectures and they give up four days of their lives for this. If there were no direct flights then they may have to set aside a whole week for our lectures. That's asking a lot from a very successful person." Mest started functioning in February 2008, exactly a year after the announcement. The school offers a two-year programme to train people who want to become software entrepreneurs. They are trained in software development and entrepreneurship. "The people we take on board don't have to be computer science graduates. They only have to be university graduates as we feel you should go through the rigour of earning an academic degree. What your major is doesn't matter. "We select the students through a fairly rigorous process. There's a four-stage interview process, with everything from aptitude tests to essay writing. Those admitted get a fully sponsored two year full-time programme. At the end of the programme, students apply for admission to a business incubator associated with the programme. The best graduates will gain admission to the incubator, which grants them seed money between $50,000 and $200,000 to get their company going. We also see if there are other places where we could help them." 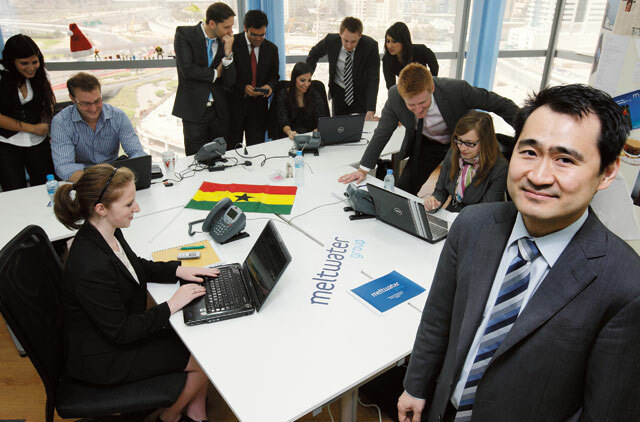 The programme costs Meltwater $2 million every year. "On January 2007 we committed ourselves to run this programme for ten years." The mission of the programme is to create jobs in Africa. "We are of the opinion that to really help society we have to create jobs," says Lyseggen. "That is perhaps the most effective way to help a community. Our aspiration is to create role models. We want to create successful software engineers. The graduates of the Mest programme, we hope, will create software companies that will be successful internationally. Everybody should look at them and say, ‘Wow, this person was actually able to do it! He/she grew up in the same neighbourhood as I did. If this person can do it, so can I.' In that manner we hope to tap into the vast intellectual resources that Africa has. If people can create value-added services and products that have commercial value it can make a significant difference in Africa. It can help create jobs, create wealth, help the continent with some of the challenges that it faces today." The reason Lyseggen chose software to make the difference is that all you need is a computer that costs a few hundred dollars. "It is entirely up to you - your drive, your imagination. That is something that puts everyone on the same level. All the resources are available on the internet. It is the most level playing field the world has ever seen. That's what made us think of opening an opportunity to create something really significant." 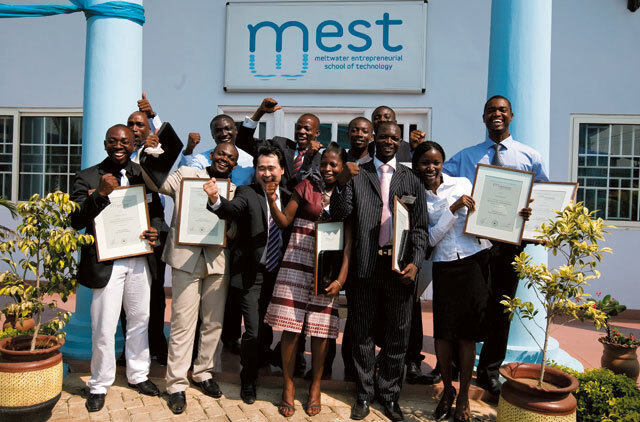 Two batches of students have graduated from Mest. "We take about 20 students every year. We set high expectations on the students. We actually call them entrepreneurs-in-training (EIT). They create tonnes of business plans during this two-year programme. If the EITs don't meet our expectations they are not invited back for the next semester. A few do drop off." Fifteen of the original 20 made it through the first batch, while 18 of the second graduated. Between these graduates, they have set up seven software companies so far with seed money from Mest. "We only invest in ideas we believe in," says Lyseggen. "There's a commercial decision criteria on which this investment is based. I am really excited about that. There is everything from music streams over mobile phones to solution for helping home retailers, to mobile gaming companies, a very wide variety of services." The Mest graduates' performance at the Launch Conference was vindication for Lyseggen. For him, it is also about building up the confidence level of his students. "When I first met the person who's behind Nandimobile, Anne Amuzu, she was so shy you couldn't make eye contact with her. She would only whisper when talking to strangers. Now, she was standing there in front of 1,000 people presenting her vision. It was unbelievable! That was something that really made us very proud." Amuzu is inspired by what she learnt at Mest and plans to replicate it. "The most valuable thing we got from the education is the exposure to the software industry of other countries in other continents. The software industry in Ghana is very young so it was very beneficial to know and see the standards and ways things are handled in places where the industry is more mature. The feedback system of the programme also enables you to grow as an individual not just in knowing more about business and technology but also in team dynamics, presentation and communication. "I feel this can change the lives of the youth who get into the programme by giving them a bigger vision of what their company should be like. It will motivate more people to bring the ideas from conception to implementation because they have seen others do it. In the long run, the software industry will grow into a formidable force for economic growth led by the youth of Ghana." He doesn't see the Mest experiment being replicated elsewhere. "It takes a lot of effort. In this situation, quality means so much more. This programme is never going to be a big one. It will remain small and focused. It will not be possible for us to sustain more than one such school. As for me, I go there five to six times a year. I recruit all the students, make sure we are bringing in the right faculty. I give lectures, monitor things right through. I wouldn't be able to do that if we had more than one school." He would like to see the gauntlet passed on to other, larger companies. "If all companies were to contribute their expertise in various fields, then we could create a chain, a movement. What we'd like to do is create world-class products and services." If Amuzu's example is anything to go by, the Mest trial is a success. "As time goes on, I am confident that more people will get the right training from initiatives like Mest and also from other entrepreneurs who have taken the lead." Meltwater has a business of about $100 million, with a client list of 18,000 across the world including brands like Coca Cola, McDonalds, Intel, Apple. Bodies such as the UN and the Bill Gates Foundation are also clients. About the company: Nandimobile Ltd was founded in July 2010. Currently supported by the Meltwater Group incubator facility, which provides the necessary support and funding, Nandimobile's objective is to leverage the high global mobile penetration rates to create mobile customer service technology that enables businesses to connect to their customers on their mobile phones in a way that can easily be managed and monitored. "All the people who have gone through Mest have benefited in one way or another," says Amuzu. "Since most of the growth is on an individual basis, different people have different stories of how Mest has benefited them. "Some of the Mest students had ideas that could not make it into the incubator but with the training that they got, they are starting up ventures. "I feel that it has benefited everybody," Amuzu adds. About the company: Streemio provides a music streaming service for mobile devices in the developing world. It aims to provide subscribers with a highly personalised music experience, better engaging the listener and thus creating a higher-value advertising medium for businesses to reach their target audiences. Samuel Owusu Darko, CEO and co-founder, holds a bachelor's degree in Biochemistry from the Kwame Nkrumah University of Science and Technology (KNUST), Ghana. He is passionate about community service. Francis Mawuli Ahose, technical director and co-founder, directs product strategy, and is passionate about technology and mobile gadgets. He was involved with a number of software projects aimed at revolutionising mobile phone usage and web advertising while at Mest. He has a bachelor's degree in Computer Science from the Royal Melbourne Institute of Technology. About the company: RetailTower develops solutions for online merchants that enable them to market their products over multiple online marketing channels. Merchants can import inventory to create shopping data feeds for price comparison engines, then measure and analyse those campaigns to optimise web traffic. Co-founder of the company Bayuo B. Blaise is responsible for guiding the company's overall strategy and management. He has a bachelor's degree in planning from the Kwame Nkrumah University of Science and Technology, Ghana, he graduated from Mest in 2010 in software development and entrepreneurship. Rinkart Asibey is the technology wizard, while Isaac Nortey handles the marketing and financial section of the company, increasing the client base and forging partnerships. Samuel Tuffuor drives product strategy and development.